It is Asbestos Awareness Week. To be inspired, visit the beautiful website of Heather Von St. James who is a Mesothelioma survivor, and help raise awareness of this preventable disease. Being such a money making occasion, Mother’s Day is difficult to avoid – but you can make things easier by preparing yourself emotionally. Please make a commitment to take outrageously good care of yourself today. Remember, you are and always will be your child’s mother 365 days a year, no matter what has happen in the past, or what might happen in the future. Having given birth to a child is a huge achievement. Sit quietly for a while and honour your status as a mother. That said, it is essential to remind yourself that being a mother is only part of who you are. For many of us (especially in the early days of separation) it feels like a really big part but make no mistake, our status as a mother it is part of us not the whole of us. Many mothers are so used to being involved with their children’s lives they lose touch with their own. Living apart from our children is like experiencing premature empty nest syndrome. Children leave home eventually which means that at some point in your life you would need to address being without them. For us, this life stage arrived earlier than expected. Like all mothers who reach this transition, ask yourself: What would fulfill me? What have I always wanted to do but never got around to? Don’t let guilt get in the way. Take off the hair shirt – it’s your life, so make sure you live it. Buy yourself some flowers today. Plan a special treat or, better still, ask your partner or a friend to go with you for a springtime walk, tea and cake, a delicious meal or whatever you love doing best. Whatever you, know that you worthy of love and kindness so please give this to yourself. For mothers living apart from their children, the occurrence of Mother’s Day can feel like the unavoidable force of advertising pushing our noses into the painful reality of being estranged from our children. An obvious place to start to remedy this is to remember that the pink cards, bouquets, chocolates and bubbly are a money making Mother’s Day marketing strategy that occurs after Valentine’s Day and before Easter. We can take comfort from knowing that we are not alone, that many mothers apart feel as we do and that like any day, it only lasts for twenty four hours. Whatever our circumstances, it is essential that we remind ourselves that being a mother is only part of who we are. For many of us (especially in the early days of separation) it feels like a big part but make no mistake, our status as a mother it is part of us not the whole of us. I am not saying that you should deny you are a mother to yourself or the world. I am suggesting that if you are not able to be with your children twenty four seven or your children do not want your hands on mothering at this point in time, divert your mothering ability elsewhere. Who or what would benefit from the mothering part of you? Is there anyone or anything out there that needs your special care and attention? Remember, to mother is not the same as smother. It is not wise to take responsibility for someone who is capable of taking care of themselves. Re-routing your mothering skills might simply be taking more time to listen to or act lovingly towards someone or something. Diverting your care and attention might take the form of voluntary work, supporting those less fortunate that ourselves, becoming a trustee of voluntary organisation or working in a charity shop. Caring enough to make a meaningful contribution without burning yourself out is what we are talking about. Who roots for you? Who bursts with pride at your achievements? Who cares about you, your choices, your work? In her truly inspirational book, Women Who Run With the Wolves, Clarissa Pinkola Estes says that we all have access to ‘the little wild mothers’. These are people who, when we take one look we think, “I am her progeny, I am her child, she is my mother, my grandmother.”’ We know instinctively that these women (and men) are ‘like the fairy godmother…mentor…the mother you never had, or did not have long enough’. Be open to receive nurture from little wild mothers around you. We are all worthy of love and support, so make sure you find your supporters. Many mothers are so used to being involved with their children’s lives they lose touch with their own. Living apart from our children is like experiencing premature empty nest syndrome. Children leave home eventually which means that at some point in your life you would need to address being without them. For us, this life stage arrived earlier than expected. Like all mothers who reach this transition, ask yourself: What would fulfil me? What have I always wanted to do but never got around to? Think back to when you were a girl – what were you good at, what were your hobbies? What interested you before you met the father of your children? Maybe the answer comes easily but maybe you’ll have to soul search. It is much better to quest for a while to find meaning in your life than to take the first shiny, pretty thing that is to hand. This year, Mothers Day in the UK falls two days after International Women’s Day, on 8 March 2013. In the lead up to International Women’s day there are a vast array of activities and gatherings for women. Take a look at www.internationalwomensday.com There are currently 1022 Women’s Day events across the world and 340 in the UK alone and the number of events keeps rising! What takes your fancy? Music festivals, markets, empowerment workshops, singing, belly dancing, business support, poetry readings and more. If you are struggling to find what lights your fire, you might just find a spark by involving yourself as a woman first and foremost. From one woman to another, take good care of yourself! Christmas is seen traditionally as a time for happiness, celebration and in particular, a time for giving. Over these past few weeks, my work with my counselling clients who live apart from their children has often included exploring their feelings and decisions around giving presents to their children. Circumstances vary. There are those who are anxious that they over compensate for hurt caused to their children by their divorce or separation. Some question whether they spend too much on their children as they compete with an extravagant ex-partner for their child’s approval or affection. Hurt and angry after years of giving presents without acknowledgement or thanks, still others wonder whether they should send a card only or whether this could be misconstrued as unloving or selfish. Some fear gifts being returned or cheques remaining uncashed, and say with sadness that they are never sure whether their child even knows that they send presents. If you usually give gifts at this time or any other, I hope that you achieve peace of mind with your decisions. I encourage my clients to examine and reality check their feelings so that they consciously choose whether or not to send gifts, as opposed to reactionary giving – giving to try to avoid rejection or not giving because of feeling hurt or angry. I remind them that we have no control over how our children receive or feel about our gifts but what is important always, is our intention. Is what we send enough to show our love without attempting to buy the love of our children? Is deciding not to send a gift or card out of respect for our child’s request for no contact or to punish our child, an attempt to make our child really feel what they are missing out on? Whether or not you are troubled by giving presents to others at this frenetic time of year, I would urge you to pause and consider ways of giving to yourself. Even without the pain of separation, Christmas is loaded with time restrictions and stressful must and should dos. Many mothers apart feel unworthy of or guilty about letting their hair down and planning fun as well as nurturing activities over the holiday period. It is so important to you and those around you to give yourself permission to enjoy yourself. Why? When we are having fun we relieve ourselves of stress, regain a balanced view on life and relate to the people and world around us as safe, life enhancing and full of potential. Live a little, luxuriate, revel, kick up your heels – do what makes you happy. Our mind is playing a trick on us if we tell ourselves that what we have done for years is the only way of doing things. If you feel in pain or overwhelmed by memories of how Christmas used to be with your children, create a new tradition for your holiday time. None of your previous customs are cast in stone. Feel as free as you truly are to redesign the old routines. Rejoice in the liberating opportunity of making new plans. Cut loose and shape things to just how you (and those who will be with you) like them. You are worthy of receiving gifts, attention, love, compliments – even if you are rejected by your children. You do not have to suffer. Take pleasure in receiving unreservedly, gifts, love and kindness from others. Accept openheartedly, without longing for the giver or gift to be someone or something else. Don’t lose sight of the good intention of the giver – to receive graciously, even a simple compliment, can be a rewarding experience for you both. Living in the past or the future separates us from reality of the moment. Of course it is natural to feel a sense of loss and sadness about not being with the children you love at Christmas but being stuck in feelings of disappointment and hurt for long periods of time does not serve you, your children or the people around you who care about you. At significant moments of the holiday period, stop, hold your child in loving thought and then honour yourself for being your child’s mother. Many people find a symbolic ritual like lighting a candle can help them be with their feelings in the moment, before letting go and moving on with their day. We can work our way though waves of grief but indignation and grudges keep us stuck. He or she might deserve your resentment and bitterness – but you don’t. Decide to side step the vengeful or galling behaviour of others we have to have to communicate with. No one has the right to steal your serenity. Choosing not to play the game or answer back takes you along the road of inner peace – surely the biggest gift you can give yourself. May you be well, may you be healthy, may you be happy, may you be at ease, may you be at peace. Until 2013, take very good care of yourself. I regularly listen to mothers living apart from children who blame themselves. Self-blame highlights all the things we think we have done wrong, making circumstances our fault. Sometimes self-blame is linked to what we believe about who we are as people. We think there is something inherently wrong with us, that we don’t deserve anything other than to be treated badly. Here is a typical scenario…I know a mother who lives apart from her children who won’t mind me telling you how she had for years, felt solely responsible for causing her children damage and pain. If she was telling you her story a while ago you would have heard her say that it was her fault for marrying the father of her children, she should have stood up to him sooner, she shouldn’t have been so emotional in court or as angry towards the Cafcass officer. Most of all she would tell you how she is responsible, she is to blame for causing her children distress even though her husband badmouths her, does not encourage the children to have contact with her and is not interested in co-parenting their children. I also hear from women who do the opposite. They blame others – another person or group of people, making outcomes their fault. They tend to view the world through the lens of other people being totally responsible for causing them distress – their ex, their solicitor, their children or their parents for rejecting them. Here is an example…Not long ago I had a conversation with woman who blamed her father for the many ways in which he had let her down over the years – he had divorced her mother and left her to live in another country when she was a teenager. When she tried to speak about her fears and worries, his problems were always bigger than hers. He had told her he would move back their ‘home’ country when he retired but he changed his mind and didn’t apologise for it. It was clear how hurt and aggrieved this woman was. She held her father responsible, blamed him, for how she felt even though she is 53 years old and he had died five years earlier. What do these two examples have in common? Very painful circumstances edge us towards a tendency to either blame ourselves or project it on to others. It’s what we do in order to make sense of and try to deal with a host of difficult feelings. Whether we turn it inwards or push it outwards, both of these ways of blaming and fault finding have a common outcome – they keep us stuck in painful feelings and stuck in time. Self-blame generates remorse, regret, a lowering of self worth and eroding of confidence. Blaming others fuels anger, a desire for revenge, and a sense of powerlessness as we stew on the injustice of our circumstances. We don’t deserve any of this negativity! With an honest heart, ask yourself whether you have a genuine need to take responsibility for your behaviour or circumstance which you might be avoiding because it feels too painful or hard to acknowledge. This might include a truthful look at how for example, you deal with your anger, how perhaps drinking is having a negative impact on your life and other people, how you monitor and manage depression and the like. Taking responsibility for yourself includes finding a professional to help you work through and take control of your behaviour. When we blame ourselves, we often believe we are responsible for causing negative feelings and reactions in others, sometimes those who have manipulated or abused us and most particularly our children. Recognise that self-blame is a trap. Blaming yourself serves no one. It does not make amends to anybody, it won’t take away anyone else’s pain, least of all yours. It won’t rid you of any guilt you might feel. Acknowledging and taking an honest look at our feelings is the key. A true sense of freedom and inner peace comes when we are able to differentiate between the things we are really responsible for and the heavy, unnecessary burden of other people’s responsibilities. Blaming others is a form of protection. When we blame others we are trying to devalue or discredit them, and in the process we hope to find ourselves and our own actions superior to theirs. Consider healthier ways to boost your self-worth and confidence, ways that aren’t linked to or controlled by anyone else. When we choose not to focus our energy on blaming others (even though they have caused us hurt and harm), we avoid the unhappy high jacking of ourselves that comes when dwelling on them, giving the person we blame centre stage in our life. They don’t deserve the star role and you don’t deserve the torment. Praise is the opposite of blame. Try turning self-blame on its head by appreciating and congratulating yourself for being the harmonious and wonderful person that you are. Likewise, try turning the blaming of others on its head by finding some redeeming trait or behaviour in this person, even if it is only that like all of us they are human and therefore flawed. Do it for you, not for them. Why should you? Because you will be shrinking the image of them in your mind, reducing their negative powerful hold on you. 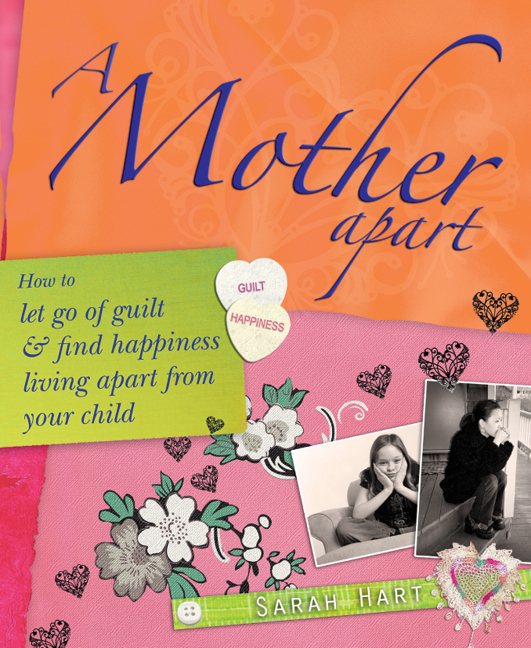 Living your own life can feel like a difficult prospect for mothers apart from children. I suspect it reminds many of us of well meaning family and friends advising us to ‘move on’, ‘forget the past’ or ‘get over’ the fact that we don’t live or have contact with our children. We know that people who care about us just want us to be happy, but ‘getting over’ isn’t easy. For those of us who chose to live apart from children, ‘moving on’ can be more difficult than we imagined. Feeling guilty, having divided loyalties and experiencing delayed grief is common. Living our own lives, having dreams and aspirations may not seem possible after all that we have been through. Perhaps we have been so focused on what our child is or isn’t feeling or what our ex partner or parents say about us that we have forgotten how to live and enjoy life. Maybe we have experienced so much emotional distress we think that we don’t have a life, don’t deserve a life and that all we are capable of, is feeling pain. This isn’t true. We are more than our problems, thoughts and feelings. Just because life has been this painful so far, it doesn’t mean it has to keep on hurting. If life is a bowl of cherries it doesn’t mean we have to settle with the pits! (thanks to Erma Bombeck). So how do we live our own lives to the full? Self care is the starting point. In part this is about nurturing ourselves – eating healthily, taking exercise, having warm baths and so on. But self care is also an attitude towards our lives in which we are responsible for ourselves. An empowering attitude that says: I am mistress of my own ship. I am responsible for my choices in life. I am responsible for identifying and meeting my needs. I am responsible for solving or finding help to solve my own problems and for learning to live with those I cannot solve. I am responsible for how much I enjoy life. I am important. I count for something and even if the most important person to me in the world rejects me I am still real, loving and lovable. Endeavour to work out what we can change and what we cannot change, then stop trying to change the things we can’t. If we don’t have control of a problem or if we have done what we can to try to solve it, we learn to live with or in spite of, our problem or circumstances. Try to live happily, focusing courageously on what is good in our lives today – and feel gratitude for these things. In time, we can come to experience that appreciating the little things, making the most of what we do have, makes what we have increase in value. Practice letting go with love. Letting go doesn’t mean we don’t care. It means that we learn to love, sometimes from afar, without driving ourselves crazy. This involves living in the present moment. We allow life to happen without forcing or trying to control it and we let go of regrets and fears about the future. The biggest risk of not living our life is that life passes us by. As a counsellor, I have worked with mothers who have lived apart from children for so many years they can no longer say they ‘live apart’, as their children are now adults with children of their own. As we work together, they grieve over having lived apart but also over the loss of not setting themselves free to live their lives and make themselves happy. As I tell them they have suffered enough, given enough, they have ‘done their time’, I encourage each one of these wonderful women to live well and to the full, one day at a time. And this is my dearest wish for you too.